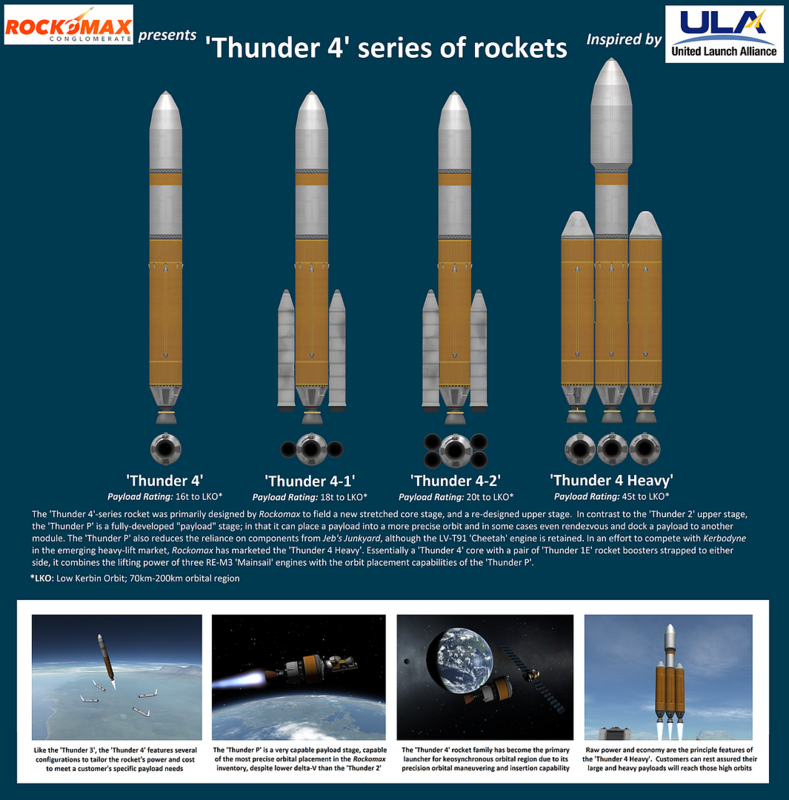 The ‘Thunder 4’-series rocket was primarily designed by Rockomax to field a new stretched core stage, and a re-designed upper stage. In contrast to the ‘Thunder 2’ upper stage, the ‘Thunder P’ is a fully-developed payload stage; in that it can place a payload into a more precise orbit and in some cases even rendezvous and dock a payload to another module. The ‘Thunder P’ also reduces the reliance on components from Jeb’s Junkyard, although the LV-T91 ‘Cheetah’ engine is retained. In an effort to compete with Kerbodyne in the emerging heavy-lift market, Rockomax has marketed the ‘Thunder 4 Heavy’. Essentially a ‘Thunder 4’ core with a pair of ‘Thunder 1E’ rocket boosters strapped to either side, it combines the lifting power of three RE-M3 ‘Mainsail’ engines with the orbit placement capabilities of the ‘Thunder P’.